At our November Download, we asked about everyone’s plans for 2013. In short: more of everything! Let’s take a deeper look at the results of our completely non-scientific sample. More mobile learning. More than half the respondents will be doing more mobile learning in 2013. Combine all the buzz these days about mobile with the fact that less than 2% of all formal learning hours are available via mobile technologies (according to the ASTD State of the Industry report), and this seems right on track. We’ve been asking our clients for years if they see a need for mobile access to the learning we’re developing with them. Big and small clients alike, most didn’t have the imperative to do so. In 2012, a small handful took the plunge into mobile. It’s only January 2013, and we’re already having conversations about mobile learning with two clients. Mobile is here to stay, at least among our group. No one reports that they plan to be doing less mobile learning in 2013. Those organizations that are doing something in this space don’t plan to turn back. To the organizations that don’t have any plans for mobile learning in 2013, we say, “Don’t despair!” Followed by a strong, “Don’t do it if you don’t have the business case for it!” For all the hype being made by those out in front of the curve, mobile is still in its infancy. Watch and learn, and you’ll be far more prepared when your time comes. We’re working on ways for our clients to take simple, inexpensive baby steps into mobile learning – stay tuned for more on that. More online social learning. 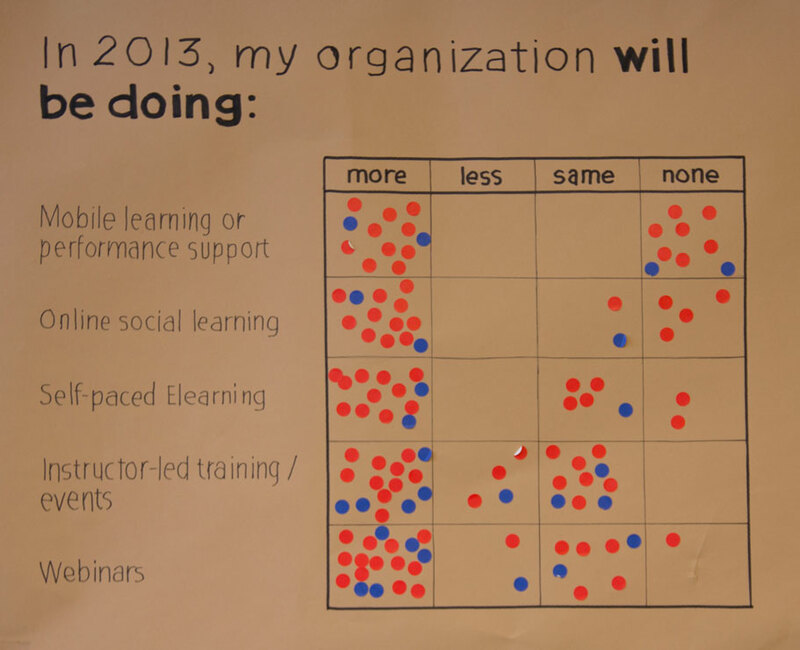 Almost everyone in our group is planning to do more or the same amount of online social learning in 2013. If you’re looking for a trend to follow, online social learning is a good one: there are existing, open platforms out there (think Facebook and LinkedIn) that don’t cost any hard dollars to get started. Your intranet probably comes with built-in discussion boards you can leverage for learning. If the experiment bombs, at least it wasn’t an expensive one. Note that we asked about online social learning. We also find in our work that the “regular” kind of social learning in the tangible world — learning from your peers, coaching, mentoring, buddy systems, networking, conferences, action learning teams and the like – is still alive and well. And with respect to elearning and learning budgets in general, it’d be foolish to separate our results from the general economic recovery, slow as it may be. 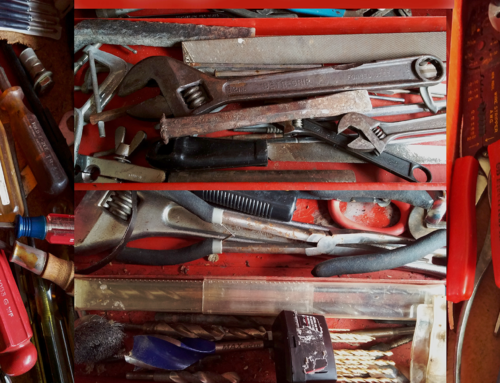 The last few years of belt-tightening and risk-averse decision-making have certainly had their impact on higher ticket items like elearning in smaller and mid-sized organizations. Larger organizations, perhaps, see an obvious and quick return on elearning given the number of learners they can reach with a single effort. More instructor-led training. ILT is here to stay. Remember the hype 20 years ago? Elearning (back then we called it computer-based training) would mean the end of ILT. Wrong! Trainers are using more remote and online technologies, but even good old instructor-led classroom training accounts for nearly 60% of all formal learning hours delivered in ASTD’s report. Among our group, everyone will be doing some ILT in 2013, although a very small group will be doing less of it than last year. More webinars. Airfares are headed (slightly) higher in 2013. Corporate travel is expected to decline. If you’re doing more ILT in a distributed organization, then it means you’re probably hosting more live training online. We like to distinguish between live web-based training with opportunities for interactivity and exploration from those horrid 55 minute slide shows with 5 minutes of Q&A at the end (that is, if you haven’t Alt+Tab-bed away to something more interesting like watching paint dry). The Elearning Guild even offers two-day online conferences with multiple concurrent sessions and no name-tag-on-a-lanyard necessary. That’s an awful lot of “more.” More mobile, more social, more elearning, more ILT, more webinars. We’ve already established that this group is a pretty optimistic bunch, and our Download is an uplifting kind of experience. Is this just a lot of wishful thinking on their part? We don’t think so. Combine an economic recovery with increased expectations of employees for performance … and we think we’ll see an increased investment in developing and transforming the workforce in 2013.